A great result from our first MakerSpace meetup! Michael H., who first experimented with CAD (computer-assisted design) at our MakerSpace Essentials: CAD Basics session, has already solved a number of home repair problems with 3D printing technology. Using "123D Design" (a free CAD program from www.123dapp.com/design) he designed two custom models and brought them along to our meetup at Sutherland Library. Self-professed tech nerd Angus helped set them up for printing and Michael took home PLA (Polylactic acid) prototypes the same night. 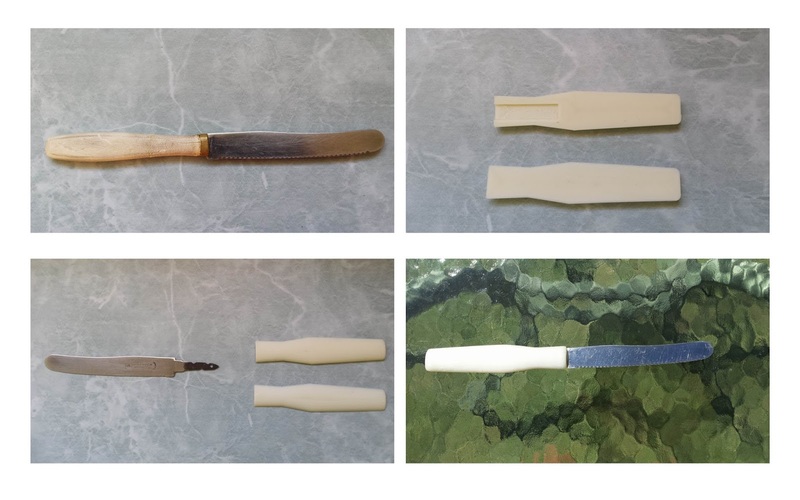 Project one was a replacement handle for a knife, it was eventually printed in two parts using ABS (Acrylonitrile butadiene styrene), which Michael processed in Acetone. After some research he also recommended using Araldite epoxy adhesive to combine metal and ABS. The second model was a design for a broken vacuum cleaner part. A replacement was not going to be easy to find. Rather than throwing away the whole machine, Michael recreated the piece in "123D Design", and – voila – it fit perfectly! There was more than just 3D printing happening at the MakerSpace. One participant worked on soldering an amplifier he is constructing using vintage 1960s valves (and I hope he returns so I can understand that sentence – stay tuned). There was also sewing, cross-stitching and a whole lot more to explore.